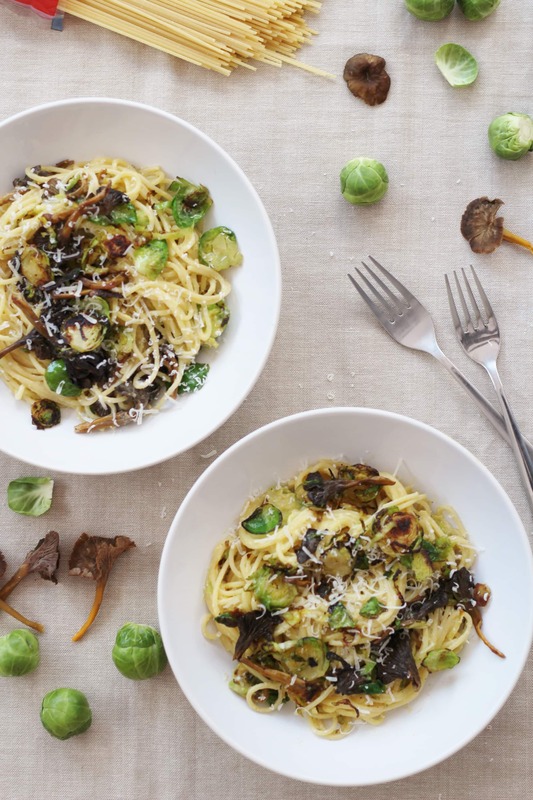 A delicious vegetarian twist on a pasta classic, this Sprout and Wild Mushroom Carbonara is a great way to use up those leftover sprouts that are lurking in your fridge! It is quite inevitable isn’t it, that after Christmas the fridge is left groaning with all sorts of leftover bits and bobs from the big Christmas feast? And no matter how carefully you plan, there always ends up being a sad forgotten bag of sprouts lurking at the back of the fridge. 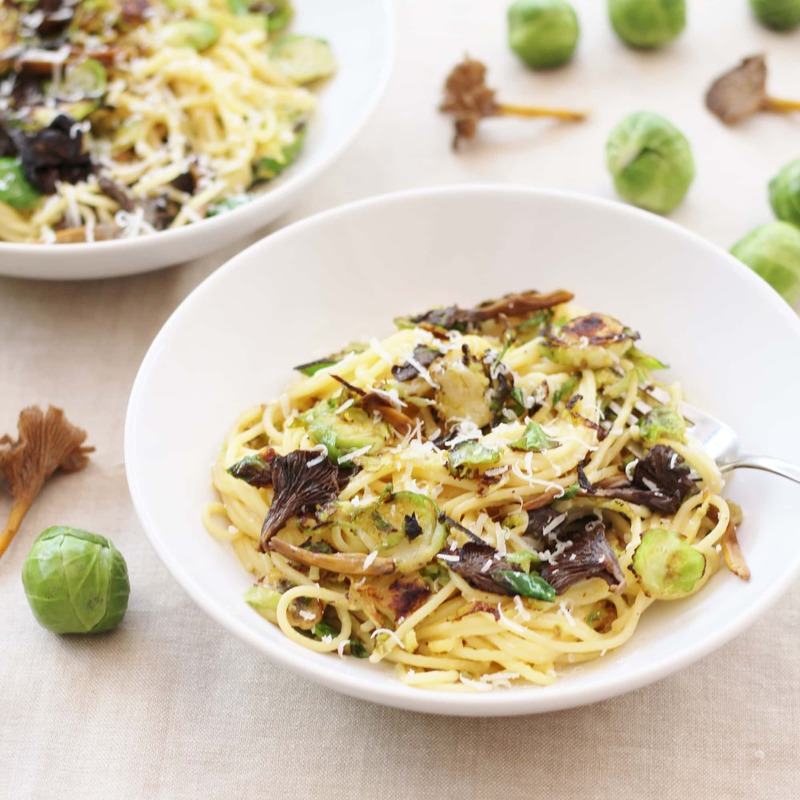 This Sprout and Wild Mushroom Carbonara is a lovely way to eat them up without repeating meals you’re probably a bit sick of by now! 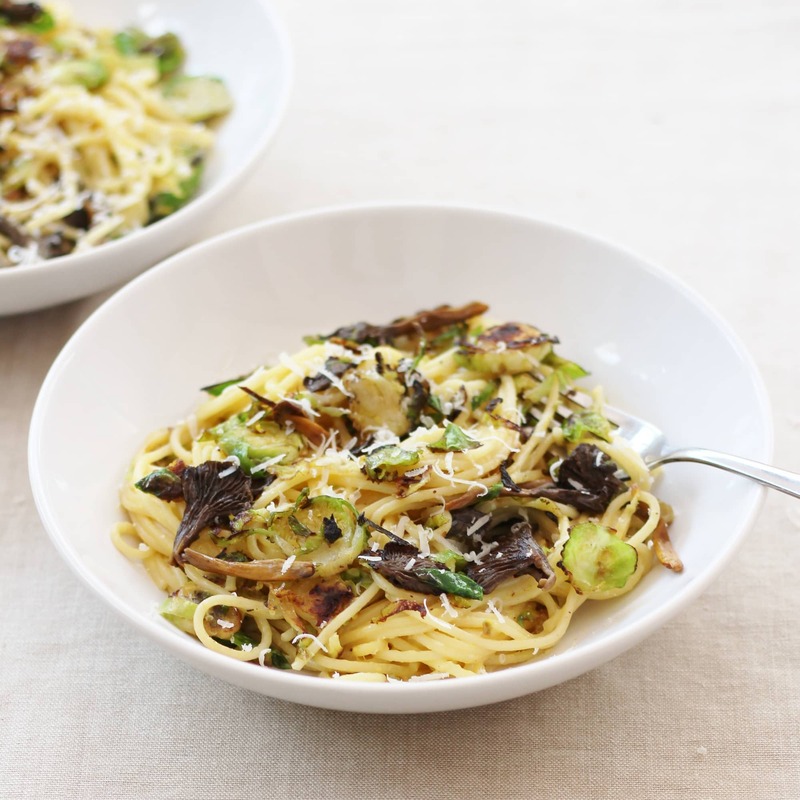 What is more this is a lovely seasonal and vegetarian twist on a traditional carbonara. I have switched out the usual pancetta and replaced it with the delicious flavours of pan fried sprouts and wild mushrooms. 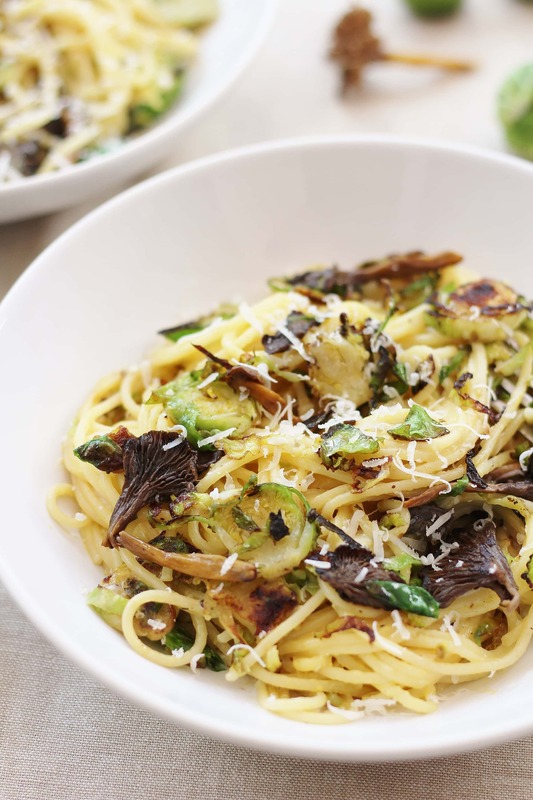 The buttery, nutty flavour of the sprouts and the garlicky, earthy flavour of the mushrooms complements the creamy eggy pasta beautifully and as a bonus, this recipe is super quick to do – easily done in under 15 minutes. Obviously if you are a vegetarian or serving this to a veggie, do bear in mind parmesan is not suitable for vegetarians, but you can get great veggie alternatives in the shops now such as Tesco Everyday Value Italian Style Hard Cheese, which is suitable for veggies. If you can’t get hold of vegetarian friendly ‘parmesan’, use cheddar or another similar vegetarian friendly cheese. Cook the pasta according to packet instructions / your own preferences. 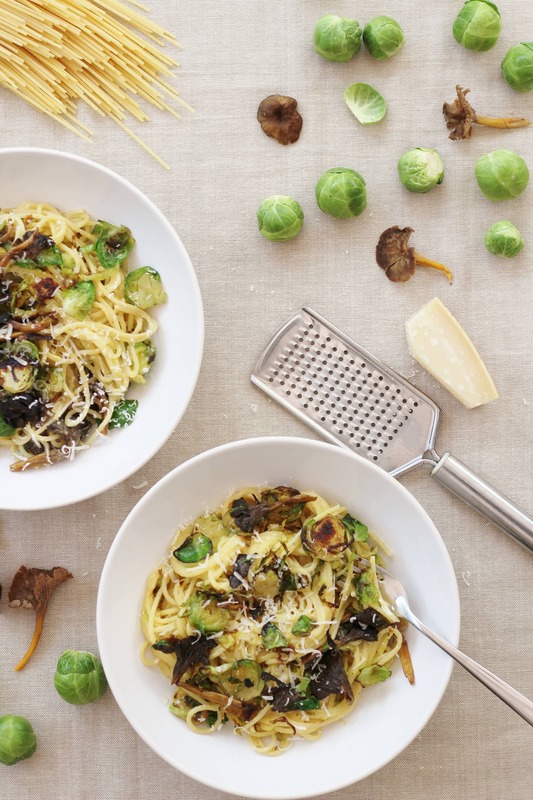 Melt the butter in a large frying pan and add the sprouts and mushrooms. Stir fry on a medium heat until golden brown. This should take about 5 minutes. When the sprouts and mushrooms are almost done, add the garlic and fry for 1 more minute, then turn off the heat, but leave in the frying pan. Crack the 2 eggs into a small jug and add the salt and pepper, whisk with a fork until the yolks and whites are combined. Quickly tip the eggs into the pasta and stir fast to coat the pasta in egg. The egg should gently cook in the residual heat of the pasta and the pan. DO NOT put the pan back on the heat. Next, sprinkle in the cheese and stir again. Finally, tip in the sprout and mushroom mix. Stir everything together to make sure it is well combined and everything is coated in the sauce. Serve with extra cheese to sprinkle on top and some more black pepper. Even though I don’t eat eggs and dairy, I just know that this tastes super-delicious (and if I did eat them, I’d be all over this)! It looks gorgeous (of course! ), and I love that you use wild mushrooms instead of pancetta. You’re so right about the leftover bits and bobs in the ‘fridge, I looked this morning, and thought, “Hmmm, what am I going to do with two carrots, a beetroot, and half each of a red and green cabbage… that’s not soup or stir-fry?” I still haven’t decided! Ha ha!